Mrs. Amos Monk died suddenly, Saturday morning, at 11 o’clock, at the Chicago Heights Hospital. 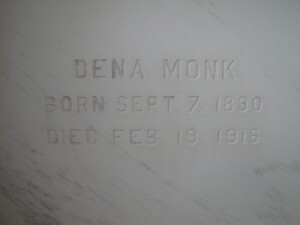 Mrs. Monk had been sick but a couple of weeks and her case was growing worse until Friday night it was decided to take her to the hospital and she was operated upon immediately after her arrival. It was found the patient had a very serious case of peritonitis, or intestinal adhesions. She survived the operation up to about 11 o’clock Saturday morning, when she succumbed. Dena Emma Louise Wiechen was born September 7, 1890, in the town of Sumner, Kankakee County, IL., and was confirmed in 1904 by Rev. Wangerin in the Lutheran faith. Later she moved with her parents to Peotone and on December 26, 1912, she was married to Amos Monk. On October 15, 1914, they moved to Beecher, where Mr. Monk accepted an appointment as mail carrier on the Beecher rural route, which position he still holds. The deceased was 25 years, 5 months and 12 days old. She leaves besides her grief stricken husband, her mother and father, Mr. and Mrs. Henry Wiechen, a brother, Elmer, and three sisters, Mrs. Fred Griffel of Newell, Iowa, Lena and Malinda of Peotone. The remains were brought to Beecher from Chicago Heights, Sunday, and the funeral, which was very largely attended, was held Tuesday at 1 o’clock from the residence to Zion’s Lutheran Church, where Rev. Going paid a beautiful and merited tribute to the deceased. The beautiful couch casket was covered and surrounded with the many floral offerings from friends. The pall bearers were Harry Wiechen, Walter Wiechen, Louis Selk, Walter Selk, Vernon and Arthur Monk. 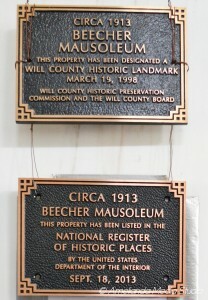 Interment was in the Beecher Mausoleum. Mrs. Monk was a lady of cheery temperament, highly esteemed by her acquaintances and friends and was loving wife and daughter. During the short stay in Beecher she had made a large number of friends who feel her untimely demise keenly and who extend the grief stricken relatives their heartfelt sympathy.